The National Limtied was B&O's premiere train (No.1 westbound and No.2 eastbound) between Washington DC (well actually, New York via Jersey City as well) to St. Louis. In the post-WW II years until the late 1950s it also carried through Pullmans to Oklahoma City, Tulsa, San Antonio and Dallas/Ft Worth. In that service, some B&O sleepers ventured west and a few Frisco/MKT sleepers came east. Most of these through sleepers were 14 roomette/4 double bedroom cars. 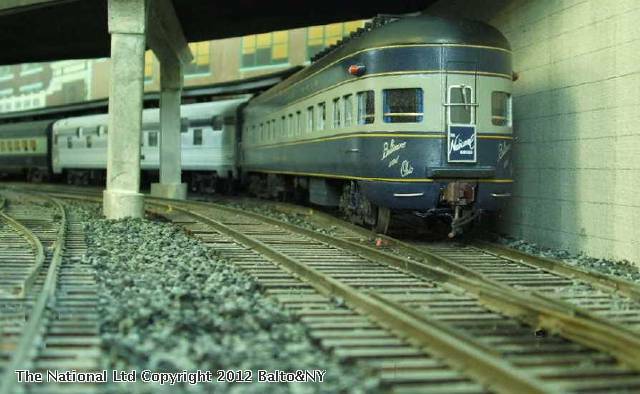 Here, the O scale National stops at Edgewater on the Baltimore & New York on its way to the Jersey City terminal. The observation is a 1948 Kasiner kit that accurately models three "River" series cars built by Pullman for Nrw York Central's Southwestern Limited in 1939. It ran from NY City to St. Louis. The three cars wer sold to B&O in 1956. B&O kept the original names of the cars and they remained in service until th end of the National in the late 1960s. The car seen here is the "Genesee River." The car in front of it is a Mac Shops 16 duplex roomette 4 double bedroom Budd sleeper. B&O bought several of these in 1954 named for birds. This one is "Bobolink," first of that series. I was aboard the prototype Bobolink on its very first day of revenue service on the National Limited in 1954 at Jersey City. It was delivered from Budd's Red Lion Plant near Philadelphia, dead-headed to Jersey City on B&O Number 36 the night before.